Topps Pro Debut Baseball will return in 2018 with more low-numbered parallel cards and a new Distinguished Debut Medallions relic subset! 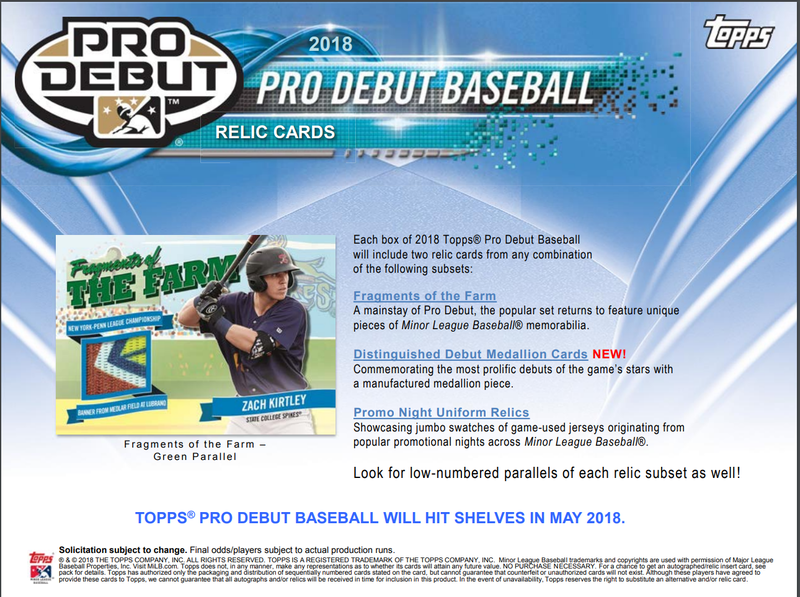 The most comprehensive Minor League Baseball trading card release of the season will continue to feature an extensive base set, with two autograph cards and two relic cards per Hobby box! Also look for an incremental Team Logo Sticker Box Topper in every box! 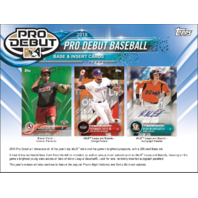 - 2018 Pro Debut will showcase all of the year's top MiLB stars and the game's brightest prospects, with a 200-card Base set. 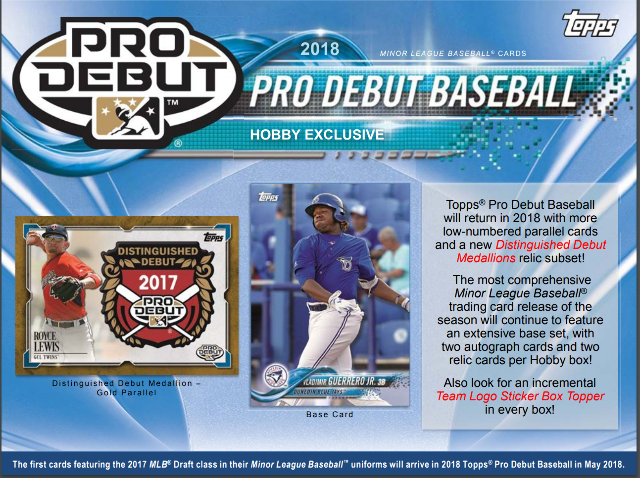 - A host of low-numbered Base Card Parallels will be included, as well as unique insert subsets such as MiLB Leaps and Bounds, focusing on the game's brightest young stars across all tiers of Minor League Baseball. Look for rare, randomly-inserted autograph parallels! 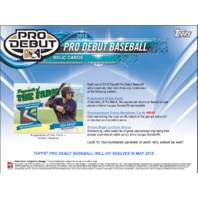 - This year's release will also continue to feature the popular Promo Night Uniforms and Ben's Biz insert subsets. 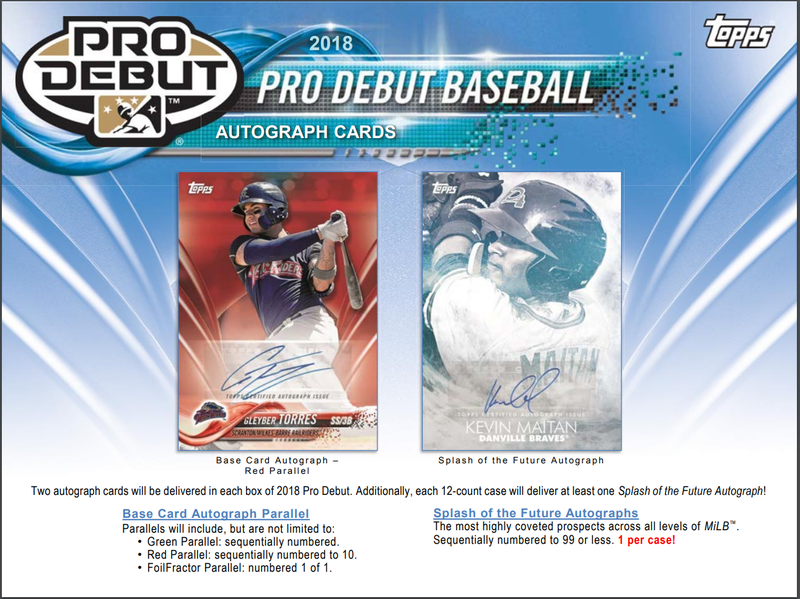 Two autograph cards will be delivered in each box of 2018 Pro Debut. 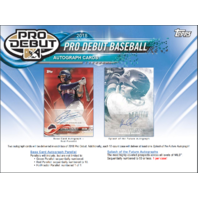 Additionally, each 12-count case will deliver at least one Splash of the Future Autograph! - FoilFractorParallel: numbered 1 of 1. - The most highly coveted prospects across all levels of MiLB. Sequentially numbered to 99 or less. 1 per case! 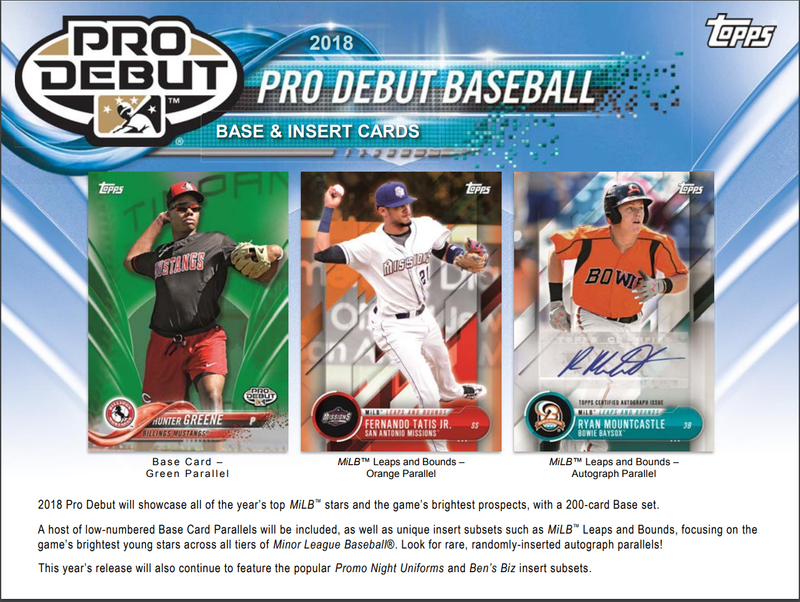 - A mainstay of Pro Debut, the popular set returns to feature unique pieces of Minor League Baseball memorabilia. Distinguished Debut Medallion Cards NEW! = Commemorating the most prolific debuts of the game's stars with a manufactured medallion piece. - Showcasing jumbo swatches of game-used jerseys originating from popular promotional nights across Minor League Baseball. Look for low-numbered parallels of each relic subset as well!